If you are looking for Photographs of Limerick then stop by our Limerick City Page where I have published some new night time photographs of Limerick. I will be adding to the Limerick at Night Collection over the next few weeks. If you would like any pictures in particular taken from around the City just drop me an email and I will do my best to oblige. The Limerick page also contains some nice shots of Limerick Graffiti and also our Virtual tour of Limerick which consists of 360 and 180 degree interactive images from around Limerick. Again I will be expanding this section all the time ( weather permitting! ). If you are looking to start your Christmas shopping early this year and want to find some unique and excellent value gifts for your friends and family then I recommend a trip out to Castleconnell to the Castle Oaks Hotel for the Castleconnell Craft Fair. The Fair runs every bank holiday and the admission cost of €3 all goes to charity. I was surprised on arriving at the amazing variety and number of stands. many people who attend on Sunday return on Monday with their friends! The Fair runs from 12-6 every bank holiday so if you don’t make it this time make sure to get there on one of the bank holidays before Christmas to pick up the perfect gift! of the exhibitors as well as links to those that have websites. This is a great example of a community working together to bring the best in handmade and artisan products not just to those in their community but to Limerick as a whole. So if you are looking for something to do tomorrow then why not hop in the car and nip our to Castleconnell and while you are picking up some bargains don't forget that the Castle Oaks does a lovely Lunch! I will post a link to the subsite I am setting up as soon as its done. would like to promote or if you would like us to setup one of our Subsite for you then just drop us an email and remember that the subsite listing for anyone who does not have a website is free! ( no catches ) Click on the slideshow below to visit our online gallery of images from where you can download any picture you want. Looking to kill some time this Sunday I took a trip out to the Munster Indoor Market. Like a lot of people I had heard it advertised and passed the signs, but I have to say I was surprised at the size of the place! A little hard to get to at the moment because of the roadworks on the Shannon road, the next time I'm going I will go out the old Cratloe road and avoid having to drive so far out of the way to then come back and turn off. The market was great with a wide selection of stalls both inside and out. There is still room for more vendors and I expect it to be really buzzing closer to Christmas as it is the perfect venue for a market as it is not affected by the weather. There are lots of little stalls selling artisan products from beautiful chocolates and biscuits also some delicious cheeses ( I came home with a chunk of delicious Chili Cheese... SPICY! ) an extensive pet supply stand and loads of different things to keep all the family amused for an hour or two. With such a variety of stalls on offer and Christmas on the way its a good spot to get some early shopping done. There is a nice stand that does personalized embroidery on things like Bibs, Hats t-shirts etc. Outside were the Veg stands and also for those looking to go green you can buy your own hens for fresh eggs in the morning! Besides the cake cheese and handmade chocolate stalls there is more food available for hungry punters outside with baps rolls and chips ready to tide you over. Overall I have to say it is a really well set out with plenty of parking spaces both at the back and at the front. I can see this becoming really popular as more people find out about it and discover this Hidden ( for now ) Gem of a market. They have a website [ here ] with detailed maps etc and info for anyone interested in taking a stall at the market. Its open Every Sunday from 11am to 5PM. Photos from Family Remembrance Day at Bedford Row with Julieanne Dineen and local bands. People in Limerick who have lost friends and family members to cancer remembered their loved ones at a special family remembrance day today. The Family Remembrance Day took place in Bedford Row, With all of those attending given a pink balloon to release in their loved one’s memory. People wrote the name of their friend or family member on the balloon before it was released into the sky at 3.45pm.October is Breast Cancer Awareness month and breast cancer survivor and chart topper, Julieanne Dineen performed her new single “River Deep, Mountain High” just before the balloons are released. Julieanne reached the Number One spot earlier this year with her debut single, Do You Believe. All proceeds from the new single will go towards Limerick Breast Cancer. Two Members of popular Limerick band Seneca fresh from their 96 gig tour of the US kept the crowds entertained, The Guests and The Night Owls were the other local bands who performed in Bedford Row. Dave and Julieanne Dineen have already raised €70,000 for cancer charities this year and hope to top the €100,000 mark by the end of the year. They have also organised three other Limerick events due to take place in 2009 including, Lords and Ladies of the Dance (South Court Hotel, October 25th), X Factor, Sin Bin (December 4th) and Limerick Celebrities Stars in their Eyes (Molly Malones, December 18th). We have just added a new gallery system to allow the viewing of the images available in our Munster Images collection from within our site. You can still go to the picasa albums to download larger versions of the images. If there are any images you would like at full size ( up to 4mb each ) just email us the album name and the image you would like and we will email it back to you. Munster Images is the Event and Sports Photography service for Limerick run as part of the Munster Business Web Site. Update: - Great Night had by all! 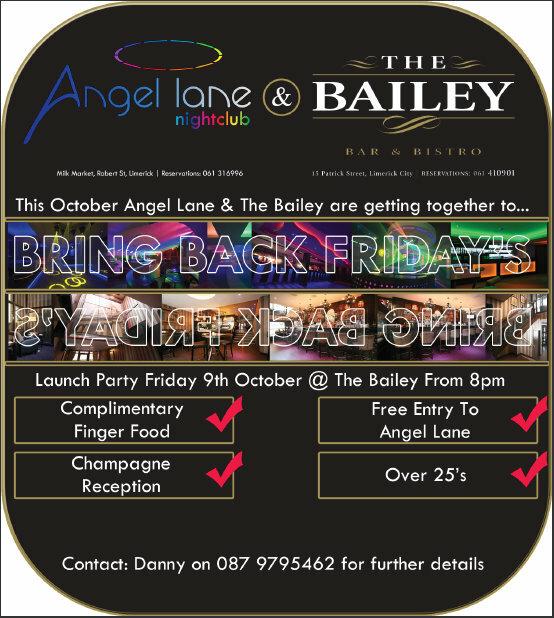 I was Talking to Danny O'Connell from Angellane and here is what he had to say about their new "Bring Back Fridays Night Launch"
Here at Angel Lane we have been keeping a close eye on the market over the past few months and we have noticed a serious decline in the number of people going out on a weekly basis, this is particularly true of the over 25’s market. It would seem they are some of the worst affected by the recession with mortgages car loans & young families etc that’s probably not surprising in the current economic climate. The over 25’s who are fortunate enough to still enjoy a regular night out most weeks or other members of this demographic who rarely get out are usually let down, particularly on a Friday night, at best Friday nights which used to be the primary night out for people living or working in the city in various offices or businesses have become somewhat of a dismal affair. Nobody specifically caters to this market anymore, instead most venues have adopted a belief of “take what you can while things are quiet” This inevitably leads to somewhat of a mixed bag when it comes to the clientele in a venue, also with such a diverse crowd most often the music and general atmosphere it entirely unsuitable to the over 25’s market. We believe that there are still substantial numbers of young professionals and older business people out on a regular basis but they are scattered among all of the various pubs and clubs in the city. Of course this means on the rare occasion that this demographic does get to go out for a night they usually find themselves to be the minority in a particular pub or club and generally don’t feel comfortable or satisfied with their hard earned night out. It seems they tend to end up in places they often have a genuine distain for by default due to a lack of real alternatives. We aim to change this, so we have teamed up with the Bailey on Patrick Street which is a stunning bar recently and tastefully refurbished set over three floors with a roof top smoking terrace. They offer elegant and comfortable surroundings, quality food and a suitable door and music policy for this market while retaining a fun and friendly environment often lost by overly pretentious venues in an attempt to be exclusive. Angel Lane as you may know is open approximately 16 months after a multi-million euro refurbishment and in that short time we have won awards such as the “Hospitality Ireland – Best Night Club” award along with press and magazine coverage in some of the most prestigious industry publications such as “Night” magazine in the UK. Angel Lane is radically different to what used to stand in this location, over the years it was known as The Market, Saints & Scholars, Arthurs Warehouse, O Donoghues, Wonka’s, The Seven Stars, The Kiwi Bar to name but a few. Since then it has been expanded and refurbished numerous times but without doubt its latest re-incarnation has been the biggest. We have 11,000 square feet set over three levels with two dance floors, five bars and two award winning smoking area’s the biggest of which is known as The Water Garden where you can enjoy your bad habit in unrivaled comfort in a fully enclosed air conditioned space with its own bar while being soothed by the sound of our indoor waterfalls. At Angel Lane we have been fortunate in the sense that we have maintained a good level of business over the past few months in particular of late we have had enormous success with the launch of two new nights I,Grade on Tuesdays and Student Thursdays which every week since the beginning of the college term has been a full house within a hour of opening. Obviously these nights would not appeal to the over 25’s market but I bring them up to make a point – That point being we are without doubt or exaggeration by far the busiest night club in the city on both of these nights. We did not achieve this by throwing the doors to everyone and anyone that would pay the admission price or by selling cheap drinks. We did it by clearly defining each night and specifically marketing it to the demographic it was intended for. Tuesday night known as I,Grade is a student night and is also the only night we operate an over 18’s door policy, therefore the only night anyone under 21 can gain access to Angel Lane. We charge €6 on the door while others charge as little as €2 or even free on occasion, yet we have a full house week on week before the competition who usually only start to fill when we close the doors. Why? Simply put we make sure to strictly adhere to our policies from the front door to the Dj box, we do not compromise on the quality of our customers, the suitability of the music provided, or the service or demeanor of all our staff be they security, bar staff or otherwise. This is why students who are more financially challenged than anyone will pay three times as much for entry to Angel Lane as they would for our nearest competitor – we provide the best product for the market and that makes it value for money. We have learned that you do not necessarily have to be the cheapest in your line of business but to succeed you do have to be the best. Being cheap only brings short term rewards but being better than everyone else has its long term gains. We apply the same logic to the student Thursdays with the differences being we only accept 3rd & 4th year Student I.D or post grads making the night over 21’s and the admission is €10 – Basically the older students do not want to mix with the mayhem that is the 1st & 2nd year students so Thursday caters specifically to them. We now want to do something similar for the over 25’s be they young professionals or older business people we feel there is nobody currently looking after your needs properly. We have created a database with over 700 local businesses all of whom are being invited to the launch of our new Friday night called “Bring Back Fridays” The aim of this night is in conjunction with the Bailey on Patrick Street we want to offer you a night set up and run with your specific taste in mind. We will make sure that the age range, the quality of clientele and the music is to your liking so that you can enjoy a night out at the end of a hard week in comfort and in an upbeat friendly environment. We literally went through the phone book to build the A-Z of local businesses we thought this night would appeal to and built our database on that information. This of course will have the added benefit of making the night an ideal opportunity to socialize or network with those you do or would like to do business with in the city. We launch “Bring Back Friday’s” this week Friday the 9th of October and your invited! Special offer 3 for €10 on selected Beers, Spirits &Alcopops all night in Angel Lane. Visit Angellane.ie for More info. The Official Opening was by Mr Billy Kelleher TD, Minister for Trade & Commerce and was followed by a Discussion Panel Chaired by Vincent Browne columnist with the Irish Times, Sunday Business Post and presenter of TV3 nightly current affairs programme. Also several companies made short presentations giving examples of how they hope to expand or utilize available resources. Attendees had the opportunity and meet over 40 professional body exhibitor's at their stands to help develop their business. With some of the best Graffiti artists in the world in attendance this was going to be an amazing day and even the weather played along today at The Skate Park.